Mike Macenko is a name that is known around the world and across this nation when it comes to softball. I played softball for over 27 years, 26 of which were on the Super Level of softball. In 26 years of Big-Time softball I accomplished just about everything there was. From winning numerous National Championships to leading the country in home runs. From hitting softballs out of Major League Baseball Stadiums like Detroit, Seattle Kingdome, Mile High Stadium, Oakland Coliseum and Municipal Stadium in Cleveland, Ohio to being named to All American teams 34 times. I have worked with your top notch Sporting Goods Companies like TPS (Louisville Slugger), Worth, Steele's Sports Co., and I joined forces with Nike, Inc. to help them promote their new softball / baseball program in 1998, thru 2003..I have played all over the this country promoting the great game of softball and all overCanada. I was fortunate enough that I started playing softball right at the top.. I am asked the question all the time, how do you get on a Major Softball team. I myself was in the right place at the right time. The right place I owe to my friend Jim Brown and the right time I owe to a fellow name Tom Coyne from Brookpark, Ohio. These two people convinced me to play softball. The rest was history once I teamed up with Dave Neale.I really do believe that playing against the best players in the country at such a young age helped me with adversity. That moment in the game where you can either fold up like a chair or hang in there and come back to win. Anybody can be great when you are up 50 to 0. It is the player that can come from behind. That can handle being in a bind and not get nervous. This is your exceptional ball player.These are some of the exceptional players that I played with or against. Craig Elliott, Mighty Joe Young, Rick Scherr, Bruce Meade, Herman Rathman, H.T. Waller, Al White (who is the late Reggie White's uncle from the Green Bay Packers), Don Arndt, Stan Harvey, Mike Bolen, Richard Wilborn, Bill Gatti, Ray Fleetwood, Clyde Guy, Greg Furhman, Denny Jones, Elby Bushong, Rick Weiterman, Doug Roberson, Ken Loeri, Mike Cellura, Scott Virkus, Greg Whitlock, Ron Parnell, Darrell Beeler, Britt Hightower, James Abercrombie.... James Abercrombie..and the list just goes on and on..,..
Who is that? James Abercrombie? 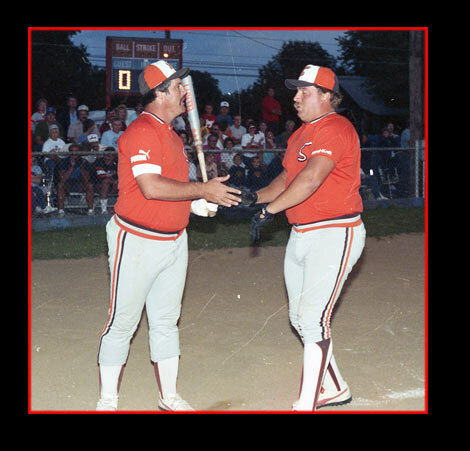 All I know is that in 1977 at Parma during the ASA Men's Major Nationals he hit one they say went as far as the one Bruce Meade hit....I have been involved in the game of softball for a long, long time. I can remember just about all the games I played in or where ever the park was. I still get chills today when ever I think about some of the championships that we won. I will never forget the performance Monty Tucker put on in 1989 at the NSA World Series. I will always cherish the memories. During my years of playing softball my teams have accomplished every thing that there was to as a softball team.. We won every leg of the 4 world championships at the end of the season. We played in the Pro League in 1982 and really should have won but finished 3rd overall. I was fortunate enough to play with Ritch's Superior when they were in their reign during the 1994 and 1995 seasons. We won the Smoky Mountain Classic both of those years. I actually ended the 94 Smoky Mountain championship with a solo Home Run to win the game against William's Worth...In 1996 I returned to my old team Steele's to try and revive the Steele's days of old. I thought we had a real good team and were real close to getting there again..... I was selected on two of the four All World teams at the age of 41 for 1997 and after looking at the situation real hard, felt that maybe it was time to step back. I feel like I made my mark in the game of softball but more importantly it was time to take a break and spend more time with my family. I am still involved in the game some way. I feel very fortunate to have been inducted into the Hall Of Fame in the NSA, ISA , USSSA and the ASA. A couple of winters ago I was put into the Greater Cleveland Sports Hall Of Fame. Some of the people that are in there are Jessie Owens, George Steinbrenner, Sal Bando and the late Bob Feller.